South Downs Leisure is a community Trust dedicated to helping and supporting the local community. If you feel that you need some help or support or that someone you know does, then please refer to any of the local services listed below for guidance. Adur and Worthing Wellbeing are a fantastic service that covers a wide range of their local communities needs including how to get more active, stop smoking services and sexual health. For further information or support call them on 01903 221450, email them: info@adur-worthingwellbeing.org.uk or visit their webpage adur-worthing.westsussexwellbeing.org.uk. They offer services or information on every topic covered below. The Worthing West Sussex Addictions service is one of six addiction and substance misuse recovery services in West Sussex. They treat all kinds of substance misuse problems and specialise in providing treatment for those with severe dependency or complex needs. Their services all provide assessment and personalised care planned treatment and recovery packages. Call: 0300 3038677 or visit www.cnwl.nhs.uk/service/west-sussex-addictions-service-worthing. Crime Reduction Initiatives (CRI) deliver an integrated and comprehensive recovery-focused treatment service across West Sussex. The services are flexible and individually tailored around drug/alcohol use whether you want to reduce your use or be abstinent. There are service hubs across West Sussex in Bognor, Littlehampton, Worthing, Crawley and Horsham alongside satellite services in GP practices, Crawley Hospital and other venues, staffed by friendly, professional and non-judgmental Recovery Workers and Clinical teams. advice around overdose prevention and basic life-saving skills. SmokeFree West Sussex is the free Stop Smoking Service operating throughout West Sussex. You are 4 times more likely to quit smoking with professional support. They offer group sessions and individual support run by trained stop smoking advisors. They also run drop in sessions ideal if you are a commuter or work variable hours. SmokeFree support is open to everyone, they even run a parents and pregnant women support group. Are a national website that offer tips on how to cut down, facts about alcohol and where to go to get the help and support you may need. For information, facts and live web chat support FRANK the national campaign for drugs advice is a great resource. There is also a live chat option online to talk directly to someone, open from 2pm- 6pm every day of the week. CRI provide a countywide outreach Young People’s Substance Misuse Service in West Sussex. The Families and Friends Network supports anyone affected by someone else’s drinking and/or drug use. If something is troubling you then get in touch with someone from their local branch. You are welcome to visit and talk to a Samaritan volunteer face-to-face. You don’t need to make an appointment, and you will be able to speak to them in a private, safe, and non-threatening environment. They will give you the time and space to talk through your problems in complete confidence. without judging. You will be offered support to think about, explore and discuss personal problems in a relaxed environment. Life can be difficult for all of us in all sorts of ways, so seeking independent help is not something to feel awkward or embarrassed about. They can help you make choices about treatment, understand your rights or reach out to services of support. The main website has a wealth of information including and A_Z of mental health issues, support and advice and share stories for support and encouragement. Sexual Health Worthing offers a wide range of services through integrated walk in sessions where you can be seen for sexual health screening and contraception plus specialist appointment sessions. Doctors; nurses; health advisors; health care workers and an administrative team are all based at the clinic. Albion’s Be Cancer Aware (ABC) campaign aims to increase early detection of bowel, breast, lung and prostate cancer amongst the over 50s in Adur and Worthing. The campaign is designed to raise awareness of the early signs and symptoms of each cancer and the importance of presenting symptoms to your GP as early as possible. The project engages the local community by attending local events, delivering our roadshow at community venues, delivering tailored sessions in the workplace and to community groups. Email Sue.brown@albioninthecommunity.org.uk or call 07880 195516. Email Louisa.Hernandez@albioninthecommunity.org.uk or call 07880 195517. CAB provides a confidential and impartial service. You can contact them by telephone on: 08444 771171 or visit one of the 11 centres located throughout West Sussex. Locations can be found either by ringing the advice line or visiting their website. 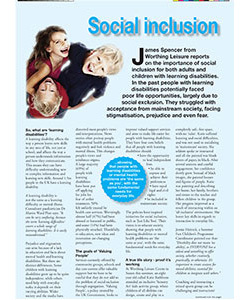 Visit: www.citizensadvice.org.uk which contains lots of useful advice and guidance. The West Sussex Credit Union offers affordable loans and savings for all people living and working in West Sussex and is a competitive alternative to high street lenders, including pay-day loans and mainstream banks. They are a cooperative, which means they are owned by their members and alongside basic banking can offer a range of products that can help people manage their finances better. Contact them for more information. can be arranged. Contact them for further information. Losing weight, even small amounts, can bring significant health benefits to people. 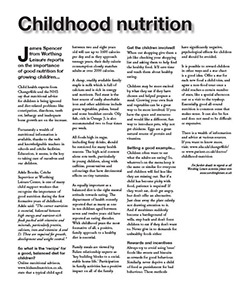 range of child and adult weight management services that aim to make people eat well, move more and live longer. weight management programmes that aim to help weight loss and improve long term health. Working in partnership with the NHS, local schools and the food partnership, we have designed several programmes that aim to reduce the prevalence of obesity in children. Why Weight is a free service for residents within the county of West Sussex who are looking to take control of their weight and create achievable goals towards leading a healthy lifestyle. We have accessible adult and child lifestyle services for families with children aged between 5-19 years old and programmes that will support overweight children and young people to reach and maintain a healthier weight. Our designated Adults service is available and will support individuals to lose weight and learn how to maintain a healthy weight alongside other people from within your community who are facing the same lifestyle challenges. 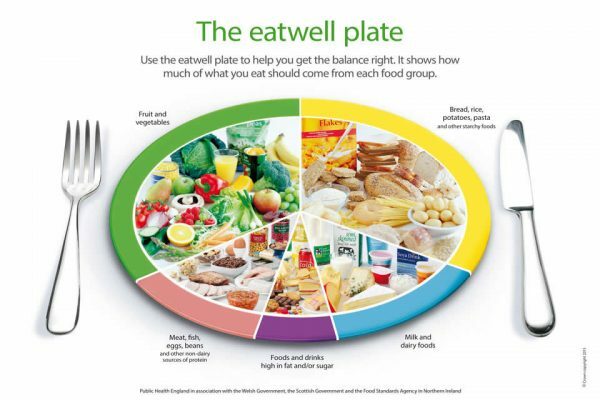 The Eatwell Plate shows the different types of food we need to eat – and in what proportions – to have a well balanced and healthy diet. Support your staff to keep healthy and well. Adur & Worthing Wellbeing team are giving free Wellbeing MOTs to employers and staff in the Adur and Worthing area. The Wellbeing Advisor will use these results to find out how you could benefit from making small changes. Our trained Advisors use accurate body analysis scales to calculate BMI and Metabolic Age (the age your body thinks it is!) plus a free one to one consultation to identify small changes that can make a big difference such as losing weight, stopping smoking, reducing alcohol and getting more active. They also provide free taster activities for staff such as lunchtime football, Zumba and more. Employee wellbeing has become a key issue for employers as organisations face the costs and potential impact of high absence levels and employee ill-health. If you have suffered from illness or recently had an operation, our Exercise Referral sessions will help you get back in to fitness. The qualified and friendly exercise instructors will supervise you over a 12 week period.These personalised sessions will help you improve your health, lose weight and get fit. 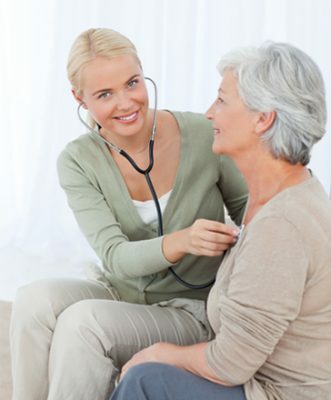 The staff are qualified and experienced to deal with patients with moderate health problems. What can the Exercise Referral Scheme do for you? Why walking is good for you? The walks are free of charge and led by trained Volunteer Walk Leaders. There is also a Back Marker who will walk at the slowest person’s pace. Each walk will take about 60-90 minutes however we do cater for those wishing to take part in a shorter walk every Wednesday. This walk lasts for 20-30 minutes maximum. You will be encouraged to walk at your own comfortable brisk pace. Please wear suitable loose, layered clothing and comfortable footwear. We will normally stop for refreshments at the end of the walk, so if you would like to join us, then please remember to bring enough money for a cup of tea! You will be asked to fill in a Health Questionnaire so that the Walk Leader is aware of any problems you may have. If in doubt please ask your GP before you come along for the first time. 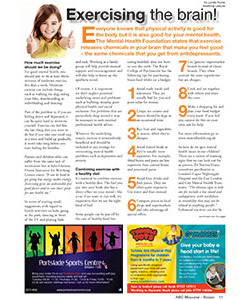 Welcome to South Downs Leisure Wellbeing pages. Community health and wellbeing is at the heart of South Downs Leisure and we strive to offer guidance, advice and information about local services that benefit people in the locality. 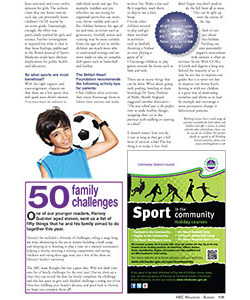 As well as providing state-of-the-art equipment, expert staff and flexible fitness programmes at award-winning facilities, South Downs Leisure have also worked with the media, to reach out further in to the community. Informative articles have been featured in key publications, covering a variety of health-based topics. Here are some examples of the features you may find of interest. We do hope you enjoy reading the articles as much as we did producing them for you. South Downs Leisure – Business Development Team.